Wayne Rooney should have retired from international football after Euro 2016, says ex-England captain Peter Shilton. 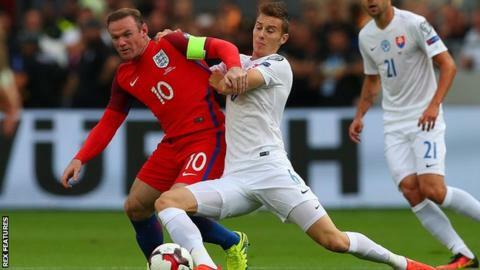 Rooney, 30, made his 116th appearance for England in Sunday's World Cup qualifying victory over Slovakia. But his value to the team has become a hot topic after he spent most of the game playing in a deep midfield role. "I don't think he's a striker anymore," said Shilton, who won 125 caps. "We are trying to fit him in, but he's not a midfield player for me. Never will be." Speaking to BBC Scotland, Shilton, 66, added: "He is spraying a few balls around, but I don't think he's being very effective. "I thought he should have retired after the Euros. It's not because he could break my record. Far from it. If he does and he plays well, fine." Rooney did not touch the ball once in the Slovakia penalty area but England's captain and record goalscorer says the debate over his role in the team has been an "overreaction" following the 1-0 win in Trnava. "I played in that role and helped us win the game," Rooney, who has scored 53 goals for his country, told Sky Sports: "Too much is getting made about it." In his post-match interview, new England boss Sam Allardyce said it was "not for me to say" where Rooney should play and said the Manchester United forward could play "wherever he wanted". But former Norwich, Blackburn and Celtic striker Chris Sutton, who won one cap for England, said such an approach was damaging. "With Rooney in a deep-lying midfield role for most of the match, Harry Kane was isolated up front and it killed his game," Sutton told the Daily Mail. "Rooney can't pick and choose where he plays, it's not a testimonial. "He is a lovely passer and technician but if he's not playing to Kane's strengths then the whole team suffer." Fellow BBC pundit Alan Shearer added: "I did think he was too deep in that particular game. I thought we had a ball-playing centre-half and a sitting midfielder so I didn't think there was any need for him to keep on going and getting the ball off the back four, even deeper than the back four at times. "I thought he would have been better served playing in the number 10 role and getting the ball and threading passes through further up the field, but they won the game so no one can complain," he told BBC Radio Sheffield. Rooney says he will retire after the 2018 World Cup finals in Russia, by which stage he is likely to have overtaken Shilton as England's most-capped player.